Operate on wheels or tracks, such as front end loaders, bulldozers, tractors, and power shovels. Individually weigh more than 4500 kg (10, 000 lb.). Note: Vehicles, equipment, and machinery that are lighter than 4500kg (10, 000 lb.) may also be secured in accordance with the provisions of this section, as well as with the general cargo securement requirements (Section 2) or Section 9, Automobiles, Light Trucks, and Vans. Lower and secure to the vehicle all accessory equipment (hydraulic shovels, booms, etc.). Restrain articulated vehicles to prevent articulation while in transit. Set the parking brake on the equipment being transported. 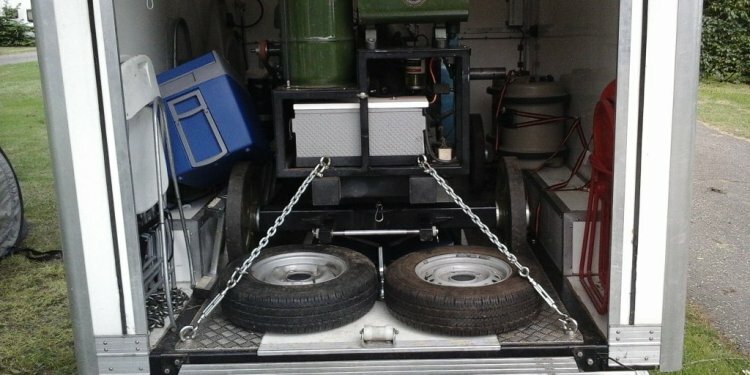 Restrain cargo using a minimum of four tiedowns, each having a WLL of at least 2, 268 kg (5, 000 lb.). Prevents cargo movement in the side-to-side, forward, rearward, and vertical directions. Attach tiedowns: Either at the front and rear of the vehicle. Or at the mounting points on the vehicle designed for that purpose. Note: More tiedowns may be required to satisfy the general cargo securement requirements (Section 2) that state: "The sum of the working load limits from all tiedowns must be at least 50% of the weight of the cargo."